Crested iris or dwarf crested iris (Iris cristata) of the Iris (Iridaceae) family is a low-growing iris that produces light blue flowers in early spring. In the U.S., it occurs from Oklahoma, Arkansas and Missouri east to Atlantic Coastal states. 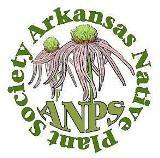 In Arkansas, the species occurs across the Ozark Plateaus, Arkansas Valley and Ouachita Mountains. The genus name is for Iris, the Greek goddess who personifies the rainbow. The specific epithet, from the Latin meaning ‘crested,’ refers to the flower’s distinctive crests (see below). Preferred habitat is well-drained, mesic, sandy to rocky, fertile soils in partially sunny woodlands. Roots of crested iris emerge from thick, horizontal, underground stems called rhizomes that grow just beneath or at the surface of the soil. Crested iris rhizomes alternate between thin and swollen sections. The prominent segments of these underground stems are modified nodes, tightly covered by persistent brown, scarious (papery) bracts, which are themselves modified leaves. The base of each bract inscribes a growth ring around the rhizome. Bracts mostly hide the light yellow epidermis of the rhizome; the solid tough rhizome interior is also light yellow. All vegetative growth, both above and below ground, originates from the rhizomes. A rhizome may produce several to as many as eight aerial stem growth points (apically and laterally) along with several new rhizome growth points (apically, after culmination of vegetative growth) that form new underground branches. Rhizomes do not produce new growth after the second year, but they persist so that thick mats may develop. Photo 1: Display of an especially healthy underground clump showing brown rhizomes with fibrous roots and green, aerial growth. Photo–late March. Aerial growth occurs as either vegetative stems or flowering stems. Both stem types have a short (less than 1 inch), slender central stem that bears flat, dagger-shaped, alternate leaves. Smaller leaves, lowermost on a stem, are imbricate and tightly encircle the round stem, while distal leaf growth forms an elongate fan with the leaves flattened in a single plane. The closely spaced node pattern of the rhizomes continues on the stems. Photo 2: With aerial growth, leafy vegetative stems and reproductive flowering stems become distinguishable. In this photo, three flowering stems are shown in the foreground, two to left and one to right. Photo–late March. All leaves above the duff layer are a yellowish to medium green and glabrous (those in duff being whitish). Leaves have a broad base transitioning to a broader mid-leaf that gently tapers to the tip. Leaves, with parallel venation and smooth margins, are mostly straight, but apically may curve toward or away from the central hidden stem. Leaves are about 6 inches long and ½ inch wide. Leaf size on a vegetative stem gradually increases distally, with a few significantly smaller leaves at the base and six to eight larger leaves above. Leaves have a tight pocket, an adaxial slit (toward the stem) in the lower portion that partially extends into the blade. As new leaves grow, one above another, each is initially sheathed by the previous leaf. The uppermost pair of leaves on flowering stems (1 to 2 inches long) forms an enlarged, sharply keeled pocket that protects developing flowers and fruits. Photo 3: Leaves overall have a flattened, dagger shape, with new leaves initially sheathed by older leaves. Uppermost leaves of flowering stems have leaf pockets that sheath the flower bud and fruit. Photo–early April. The terminal inflorescence consists of one or two flowers, with those of a colony tending to bloom in unison. Flowers are large and showy, 2 inches in diameter, typically an overall pale blue to lavender, but occasionally white. They have three sepals (falls), three petals (standards), and three style-arms. Hidden underneath each style arm is a stamen. The three showy components, in a radial pattern, are arranged in layers, the sepals lowermost, petals next, and style-arms uppermost. The petals alternate with the sepals and style-arms–the style-arms, and the hidden stamens, lie directly above the sepals. Sepals are united at their base to form a slender tube, to three inches long, that extends to the ‘inferior’ ovary hidden deep within the pocket formed by the two uppermost leaves of the reproductive stem. Sepals are 1¼ to 1½ inches long and petals are somewhat shorter. Style-arms are about 1 inch long. Photo 4: Two reproductive or flowering stems and a vegetative stem. Note the sheathing of leaves by lower leaves and the opposing pair of ‘pocket-leaves’ that subtend flowers and hide the ovary. The long flower ‘throat’ is the tube down which pollen tubes grow to reach the ovules in the ovary. The ovules become the seeds. Widely spreading sepals are obovate (narrow at base and broad above mid-section) with a broad marginal band of the overall flower color that surrounds a narrow purple band. From mid-sepal downward, the ‘signal-patch’ (the area of contrasting color) has three ridge-like crests (the basis for common and scientific names) that extend toward the flower’s throat. The golden yellow central ridge is vertically rippled (when seen from above) while rippled parallel ridges on either side are yellow on their inward side and white outside. The area between the three ridges is yellow with purple markings. The ridged area of the sepal is strengthened (to support large bees) while the remainder of the sepal’s surface is flimsy. The widely spreading petals and style-arms are of uniform color. Petals are narrowly obovate to oblanceolate with the rounded apical portion and undulating lateral margins. Style-arms are oblong with a slightly tapered base and a rounded, up-turned fringed apex that has a deep v-notch. Photo 5: Flowers of this plant are almost white. Sepals with colorful signal-patches are overshadowed by the shorter style-arms. Petals are positioned between and above the sepals. A single large stamen is located directly below each style-arm, with the elongate anther pressed against the roof of the style-arm. The pollen-receptive stigma is slightly exerted from the tip of the style-arm’s abaxial surface. The grooved, triangular ovary, ¼ inch long, is hidden at the base of the long floral tube. Photo 6: Sepals to left and petals to right. Style-arms remain in position; note long white anther directly below arm. Stigma is contained by style-arm. Note ovary’s position at base of style tube, an adjoining flower bud hidden by leafy bracts, and nodes along stem. With fertilization, ovaries develop into capsules that remain hidden within the leafy pockets. Half-inch long capsules have a pointed-oval outline in side view and a triangular cross-section. Capsules dehisce within the leafy pockets. Small, dark-brown, roughened, oval seeds are less than ⅛ inch long. Seeds have a sticky appendage (viscid aril) that wraps over their top so that seeds may attach to birds and animals. Crested iris, being a short plant with intertwined rhizomes, is a choice plant for a woodland garden or natural area, if it remains uncluttered by other vegetation. Partially sunny areas with various well-drained mesic soils are ideal. This blue-flowering plant survives temporarily dry soils, is not eaten by deer, and does not readily self-seed. It can be a delightful, low-maintenance, six-inch-tall ground cover. Crested iris is one of eight species of the genus Iris that occur in Arkansas. Of the other seven, only the rare dwarf iris (Iris verna var. smalliana) is low growing. Dwarf iris, a species of conservation concern, typically has dark blue flowers with a golden signal-patch without crests and with rhizomes of a uniform narrow width. This entry was posted in Know Your Natives, Native Plants, Wildflowers and tagged Crested Iris, Dwarf Crested Iris, Iridaceae, Iris, Iris cristata. Bookmark the permalink.